Uses : The leaves are astringent, febrifuge, sedative, tonic and vermifuge. They are useful in dispersing swellings of the joints from acute rheumatism and of the testes from suppressed gonorrhoea. The juice of the leaves is used for removing foetid discharges and worms from ulcers, whilst an oil prepared with the leaf juice is applied to sinuses and scrofulous sores. A decoction of the stems is used in the treatment of burns and scalds. The dried fruit is vermifuge and is also used in the treatment of angina, colds, coughs, rheumatic difficulties etc. The fresh berries are pounded to a pulp and used in the form of a tincture for the relief of paralysis, pains in the limbs, weakness etc. The root is expectorant, febrifuge and tonic. It is used in the treatment of colds and rheumatic ailments. The plant is said to be a malarial preventative and is also used in the treatment of bacterial dysentery - extracts of the leaves have shown bactericidal and antitumor activity. The leaves are used to repel insects in grain stores. Extracts of the leaves have insecticidal activity. The fresh leaves are burnt with grass as a fumigant against mosquitoes. A decoction of the leaves and the vapours are employed in baths for treatment of febrile, catarrhal and rheumatic affections. 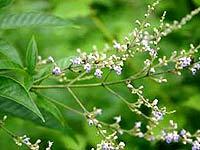 The flowers are astringent and are used in fever, diarrhoea and liver complaints.